Sean Sweeney and his son Tyler Joyce were found dead in 10 inches of water on Easter Sunday 2016. A FATHER AND his three-year-old son drowned after becoming trapped in a ditch while using a shortcut into an estate, an inquest has heard. Sean Sweeney, 36, and his son Tyler Joyce were found dead in 10 inches of water at an unauthorised access point into Ashington Park in Dublin 7 on Easter Sunday, 27 March 2016. The last footage of the pair captured on CCTV the previous night showed Sweeney staggering and stumbling with Tyler asleep on his shoulders. Witness Stephen Hughes was among the last people to see the father and son alive outside a fast food outlet on Royal Canal Park at 9pm. “I noticed a man walking up the road, stumbling, with a kid on his shoulders asleep. He was definitely drunk at least, stumbling over his own feet. He [could] barely walk. The kid was asleep 100%,” he told Dublin Coroner’s Court. Witness Jason Quinn, then 15 years old, was using the shortcut to get home at around 9.45pm on 26 March when he heard the sound of a child’s scream. It was “pitch dark”, he said. “I heard the noises of branches again and then the scream of a child. I am sure it was a child. It was not far from where I stopped,” he said. When he heard a loud voice he feared it was a drug user and he ran all the way home. He told his father what he had heard. Two bodies were found the following day by a passer-by at 3pm. “I saw a pair of shoes. I took a second look and saw a body face down in a ditch. There was a gold football beside the feet,” Cian Finn told the inquest. Inspector Thomas Lynch of Coolock Garda Station said Sweeney and his son were captured on CCTV on Royal Canal Park at 9.03pm. “Mr Sweeney was walking and little Tyler was up on his shoulders. He was staggering and stumbling along,” Lynch said. Sweeney had crossed the 9th lock on the Royal Canal, went through a fence and crossed over a wall into Ashington Park using a mud path. The track, next to a deep trench, is commonly used in the area as a shortcut. “The trench is a 10-foot drop with very steep banks. The water was 10 to 12 inches deep in places,” Lynch said. Members of Dublin Fire Brigade (DFB) used an extension ladder, ropes and a pulley system to retrieve the bodies from the ditch. Asked if it would be difficult to get out of the ditch if someone fell in, DFB officer Derek Cheevers said he imagined it would be. 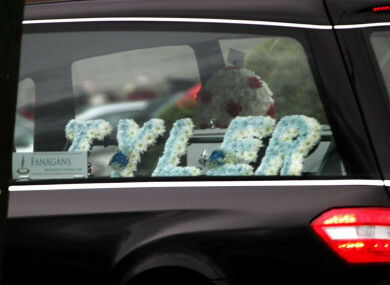 Tyler’s mother Pamela Joyce formally identified her son. The cause of death in both cases was drowning. Toxicology results showed evidence of methadone, the anti-depressant mirtazapine and the sleeping tablet zopiclone in Sweeney’s system. Sean Coleman, solicitor for Irish Rail, said there are plans for a footbridge and an unmanned station at the spot where the father and son tragically drowned. He said funding for this has been allocated. No timeframe was given. There are ‘No Trespass’ signs to deter people from using the shortcut but it remains an ongoing problem, the inquest heard. The track saves at least half an hour on journeys between Ashington and Finglas, the court heard. Email “Father and three-year-old son drowned after falling into ditch, inquest hears”. Feedback on “Father and three-year-old son drowned after falling into ditch, inquest hears”.